Currituck Heritage Park located in Corolla, NC is a great place to picnic with the entire family. Massive live oak trees Pet friendly Outer Banks vacation rentals provide the perfect canopy for a leisurely afternoon. Dogs must be on a leash. Kitty Hawk Dog Park features two fenced dog areas, one for larger dogs and one for smaller dogs. There's also a water fountain and a small shaded area with seating. A walking trail, playground, and restrooms are on site. Wright Brothers National Memorial is the official site of Orville and Wilbur Wright’s first powered flight. Make a stop in the Visitor’s Center and you’ll see a full scale replica of the 1903 plane. Don’t miss the granite Wright monument atop Kill Devil Hill or the reconstruction of the Wright Brothers’ 1903 camp. Pets must remain on a leash no longer than 6’ in length. Nags Head Dog Park - established in 2017. The park includes two fenced areas, one for large dogs and one for small dogs less than 30 pounds. The park is shaded and provides ample space for dogs to make new friends and exercise. A water station is a nice touch and a double-door entrance/exit system prevents escapes. Located next to the soccer fields at Satterfield Landing Soccer Complex. Jockey’s Ridge State Park in Nags Head, NC offers expansive open dunes as well as wildlife trails and picnic areas. Pets must be on a leash no longer than 6’ long. Remember that the sand (no matter where you go), is 15-20 degrees hotter than the air temperature. Remember to keep your dog's paws off the hot sand and bring lots of water! Roanoke Island Festival Park on Roanoke Island features an exact replica of the Elizabeth II, the 16th centrury ship that brought over the first colonists from England in 1587. Festival Park hosts numerous summer events such as concerts, art shows and more! Dogs are welcomed but must be leashed and are only permitted on walkways. 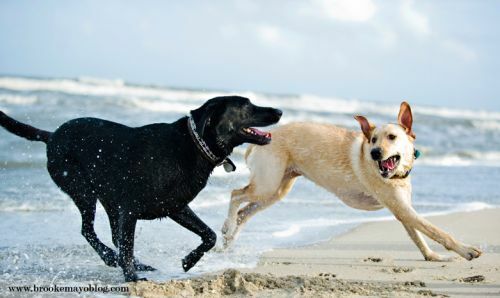 Cape Hatteras National Seashore is one of the most dog friendly beaches on the Outer Banks. Dogs must be kept on a leash no longer than 6’ in length while in the park. There are miles of beautiful beaches to explore. Located in Duck, NC Outer Barks offers a large selection of unique gifts and supplies for every dog lover. Weekly “Yappy Happy Hour” and “Barker Brunch”. Humans welcome to accompany their canine friends to all events! Located in Nags Head. PetSmart offers a varity of options: Dog food, treats, healthcare, grooming, training, etc.